Our banquet is usually on a Thursday night from 6:15-9pm. We do not charge for any of the activities. Our homeschool group covers the expenses that I work hard to keep at a minimum. It typically costs between $150-$200 for 120 Dads and Daughters. We also have a potluck dinner to keep from the expense of catering. 1. Dads/Daughters start arriving at 6:15. Volunteer moms are in place to help receive the food, set it out, direct to activities and help “man” the activities. Programs are being handed out by my sons or an older girl. 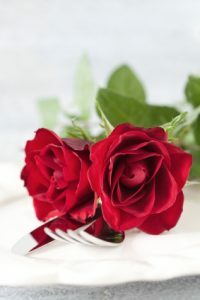 Dads go to one table or counter and pick from a basket of pre-made flower grams(this is is a single artificial flower in a decorative cellophane bag with a valentine pencil and few pieces of candy). The dads pick a precut tag, write a love message to their daughter, tie it on the bag and leave it to be delivered later by the volunteer moms. He does this for each daughter. There is a mom at this station helping the dads know what to do and collecting the grams in a basket once they have been written. At the same time the Daughters go to another designated spot to fill out a tag on a little clear cellophane bag(like the ones you find in the cake decorating section) that has a ballpoint pen and several pieces of good chocolate candy since it’s harder to find inexpensive “dad” items. I try to find the name brand festive wrapped chocolates reduced after Christmas. Since one dad may have 3 or more daughters then we have the tags from all of the daughters tied to one bag. That way the dad is not getting 3 bags of the same thing. The dads and daughters are then ushered to a line for their picture to be taken together. We have been blessed to have photography moms in our group that have been glad to help in this area when asked. They will take a Sunday School room, foyer area, etc and put a backdrop up or simply grab an artificial tree and a nice chair and take the pix with their digital camera. After they take the pictures then they print them out during the rest of the banquet time. Either they bring a laptop and printer from home or they have our group buy an inexpensive photo printer and use it with their laptop. This is always the highlight of the evening since they get to take the picture home with them and it captures the special moment. Our photographer mom will upload them to facebook and several use them as their profile pix. The picture line can take a little time if you have 40+ family units as we do, so some can be taking pictures while others are filling out the grams and we may have an activity or two going on in the dining area. Build a Tower: get conversation hearts and give a handful to the dads and daughters at the dining tables as they are waiting on the rest to finish pix and grams. Take the hearts and try to build the tallest tower without it crashing. Pen/Paper Games: can also have a coloring sheet for younger ones or word games for older ones that they do together as they are waiting. Sweetheart Messages: if you have disposable white paper covering the tables then the Dads/Daughters could write sweet messages to one another or draw them together with their names under the pix. Table graffiti!! We decorate the tables the day before and have pretty netting and candles running down the middle of the table. We have food tables, dessert tables, tea station and a special punch station complete with 2 punch bowls, red punch served in plastic punch cups by 2 volunteer moms. The punch is always a hit! We started out with finger foods but found out that men clean those out pretty quickly and needed heartier food; therefore we now tell moms to send hearty potluck food and a dessert. This should go without saying but all dads and daughters dine together ;-). As the dads and daughters are finishing up their meal we usually ask one of the dads to share a few thoughts from God’s Word to encourage the attendees. Sometimes a dad and teenage or graduated daughter will share together. This is usually ten minutes which is a help for the younger ones attending with dad. Remember the prom and how you were introduced back in high school days?? Well, that’s where this idea came from. The names have been gathered on a clipboard by a mom as they stood in line for the pictures. The emcee now has that list and calls out in order of line up the dads and daughters. Where we eat there is a platform that has steps up the side. We put an archway at the middle of the stage that has steps in front of it. The emcee(a man that does not have daughters at the function) announces the dad with his daughters and they walk across the stage, pause under the arch and then walk down the steps back to their seats. The dad walks with all of his daughters at once. We started out with a dad walking with each daughter but that took too long with 40 dads and 80 daughters. If the dad has a little one he can carry her. They can walk arm in arm, holding hands, etc. Do whatever works best. This is a sweet time of honor for the dad and daughter(s) and it lets others know who belongs to who if your group is larger. Soft music is playing during the presentation time. We didn’t do this the first year but added it the last two years. We preselect 4 couples and play the game that is like the old “newlywed” game show. We have poster board and ask the questions while the dads/daughters are in the picture line. The emcee asks the questions and then they give the answers as they are sitting beside each other. We give an ice cream shop certificate for the winners. This is like the cake walk sans the cake! We placed 24 strips of masking tape around 2 different sets of tables in the room. That was the only space large enough to do this activity. The 6 inch strip of tape each had a number 1-48 or you could do 2 sets of 24 and give 2 prizes. The strips were approx 2ft apart. Each dad took a daughter and stood on a piece of tape arm in arm, holding hands or carrying their little one. The music played, everyone started walking around the circle until the music stopped. Have one of the daughters sitting draw a number and that couple receives a gift. This year I found cute mugs at Dollar General that matched. One was a mini (daughter) size and one regular (dad) size. We did this 4 times so that dads could rotate between daughters if they have more than one. This turned out to be a lot of fun. This is nothing formal or fancy but we give it a shot and it is precious! We find one dad, at least, that knows the basic 3 step waltz. He and his daughter(usually teenage or graduated) demonstrate on stage s-l-o-w-l-y as the dad talks thru the steps. We don’t have a “dance” floor. We move our food tables back and spread out around the back and sides of the room. A simple waltz, like the Butterfly Waltz or Moon River, is played while they try to waltz. Some dads with younger ones pick up their daughters and dance holding them or twirl them around. Again, it’s a sweet memory that is being etched in their minds not the precision of the dance step! A closing prayer is given before the waltz because some will need to leave immediately following or will opt out of the waltz. We try to make sure that the dads/daughters get all of their dishes and pictures before they leave. The grams can be given out now but we have found that too many end up leaving without them so several of us moms try to quietly deliver them during meal or presentation time. Emcee: I have a wonderful homeschool dad whose children are all grown that does an excellent job emceeing our banquet. I have used a college young man when my dad could not make it one year. Basically he keeps everything running smoothly, gives instructions, asks the game questions, etc. We usually give him a gift certificate to a nice restaurant in town for he and his wife. We try not to take any dad away from their daughter except for the 10 min message. Costs Cutters: I cut costs by buying red and silver candy after Christmas to put in the goody bags. I buy the valentine goody bags, napkins, pencils and dessert plates after Valentine’s Day for the next year. I keep my banquet “stuff” in a container from year to year to reuse. I find cute little buckets/tins/vases/baskets to hold napkins, flower grams, goody bags, utensils, etc at the dollar stores. I hit them all before the banquet to see what they have in stock.